You will be creating a slideshow for future 6th graders to share what you have learned about your first year in middle school. You will be sharing your highlights and lessons learned. Go to this link for directions. You will be starting this project in school. If you do not have the Internet at home, then you can also write your information out on paper. This project will also be assigned for homework. You may come back at lunch time to use the computers in class if needed. Your project needs to be finished by Wednesday, June 4th. You will be presenting it on Wednesday in either math or science class. Use this link for the class pictures. Use this link for brainstorm ideas. 5/23/14 Math. 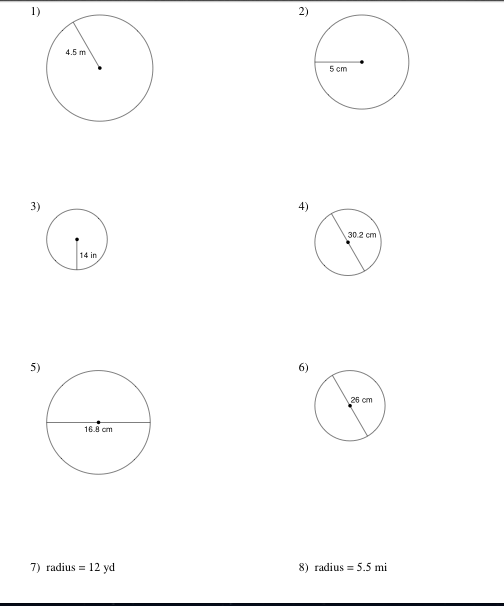 Use these worksheets to calculate the circumference or area of circles. Show all of your work on binder paper. 5/19/14 You will be working on an earth-quake preparedness project that you will also be sharing with your family. You will begin today by researching some key ideas for becoming prepared, create an earthquake checklist and design and produce an earthquake preparedness brochure to inform other people about how to keep safe in an earthquake. For today: go to this website: cdc.gov. Then go to open up Google Docs and create a document: earthquake notes. Use this document to record information you think will be important to share with your family. Science You will be going to several web sites today to learn more about earthquakes. Yesterday we talked about Parkfield, Ca. Today you will learn more about Parkfield and earthquakes. You will need your Netbook and your Science notebook. Follow all of the directions here. Use the links when indicated and record your information in your Science notebook. 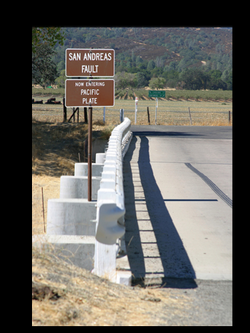 1) Where does the San Andreas Fault appear in Parkfield? Click on the link for aseismic creep. 2) Write an explanation of what it is. What other city has visible examples of asesmic creep? Go back to the Parkfield page. 3) When did Parkfield start recording their earthquakes. What is the approximate interval? What is the average magnitude? What did the USGS predict would happen in 1993? What was the result? 4) What do scientists measure in Parkfield. 5) What is the goal of SAFOD? 6) What was discovered in 2004? Why is this important? Look at this image of the bridge leading into Parkfield. Create an illustration of this in your notebook. Include the sign and what it says. Answer these questions in your notes. What do you think is written on the other side of the sign? How did the bridge become curved at the far end? Science: Earthquake Interactive learning site. Start with the first link, then work through the remaining links to learn more about earthquakes. Click here. Geometry NLVM Finding area of irregular shapes. Use this link to access the activity. Math quiz. You will need the math textbook for some of the items on the quiz. Click here for link. Science: Use the document here to respond to what you are learning about regarding plate tectonics. Be sure to work through all of the readings and activities in the web site listed below before writing your summary. You will need to make copy of the document and rename it with your name. When you are finished, share it with me. Click on this link to begin the activity. Work through the pages and the activities. See how well you can with matching the names of the plates to the correct location on the crust. Science You will be taking notes on a timeline for the theory of plate tectonics. Download the Powerpoint file below to your desktop and open it. Follow along with this for the note taking. Math quiz. Click here to take the quiz. Use this site to help you identify your rocks. Use this site to compare images of rock types to your rocks. If you do not have your rock collection in class. Use this site to copy information in your Science notebook so you can start identifying your rock types at home. Thursday March 20, 2014 Period 7. Use this link to go to AAAMath.com and practice your skills with unit rates. You will be using this interactive web site to learn some more about rocks and the processes and changes that rocks can go through over geologic time. Click this link to begin. You must get through all of the links and complete the online test by the end of the period, or you will have to come back at lunch time to complete your work. Here is the link. Use this link to go to the presentation for Science. Use the Math form to share your feelings about math. Use the Science form to share your feelings about Science. 2/14/14 Math quiz Click here for the quiz. 2/11/14 Science. Go to this link: Read through the information on the page. Click on the different links. Use this document to record what you are learning. Science Inquiry: Go to this link. You will be working on an inquiry to explain why the Earth has seasons. 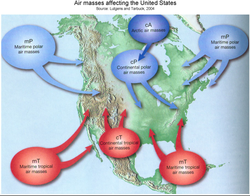 Once you have finished your Science notes, use this picture to help you draw a map of the United States and the types of air masses that affect the weather. In your Science notebook, use the left side page to draw the map and air masses, then explain the characteristics of the air mass types. use your Science book and your notes for help if needed. How In The World Do Clouds Form? Use this Google form to record your information. Sea breeze / land breeze project. Open up a new page in your Science notebook. Create a table with 3 columns and 24 rows. Label the first column time. Begin with 6:00 a.m. Continue labeling the time, 7, 8, 9, 10, 11, 12 p.m. etc. Continue until you get back to 6:00 a.m.
Label the second column land and label the third column ocean. Click on the link below. 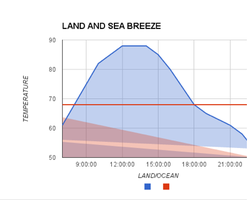 You will be using an interactive diagram of the land and ocean for the investigation of land and sea breezes. Use the pause button so you can record the time and temperature over the land and the ocean for a 24 hour period. Once you have finished recording all of the temperatures for a 24 hour period of time, watch the interactive diagram again. This time watch to see when the high pressure area is over the ocean and when the high pressure area is over the land. When there is a high pressure area over one part, what over the other part? Your completed graph should look like this. Science You will be working with a partner to complete a presentation on Earth's systems and energy. Only one of you will need a Netbook. The other partner will be looking up information on the assigned page in the Science textbook. Read the material together, then discuss how you will phrase the information for your assigned section. You will have 25 minutes to complete your slide. After that, you and your partner will present your slide to the class. Go to your gmail account to get the link for the presentation. Science assignment: Use this link to get the note taking form for Science. Make a copy of it. Rename it with your first and last name. Use the copy to type in your answers. You will need a Science textbook. The pages are indicated on the document. Taking sample test. Use this link to get to power school. Type in your Username and password. Wait for further directions. Math. Nov. 12, 2013 Warm Up. Click here to go to the warm up. Science: Use this web site to learn about the three types of heat transfer. conduction, convection, and radiation. Write a 4 paragraph essay on what you have learned about the three types of heat transfer. Your first paragraph explains the difference between heat and temperature. Your second paragraph will explain about conduction. Include an explanation of the activities for this type of heat transfer. Provide examples of this type of heat transfer in your daily life. Your third paragraph will explain about convection. Include an explanation of the activities for this type of heat transfer. Provide examples of this type of heat transfer in your daily life. Your fourth paragraph will explain about radiaiton. Include an explanation of the activities for this type of heat transfer. Provide examples of this type of heat transfer in your daily life. November 7, 2013 Warm up. Click here for the warm up. November 5, 2013 Warm up. Click here for the warm up. Continue with the use of models for division of fractions. Include division with mixed numbers using the model method and the standard algorithm. Exit ticket: Click here for the exit ticket. October 29, 2013 Warm Up Click here for the warm up. After watching the video, answer these questions in your Science notebook. 1) Describe what you saw in the video. Be specific. 2) Name all of the transfers of energy that you remember seeing. 3) Watch the tire scene again. Write down exactly what you see happening to the tire. 4) In your own words, explain how this demonstrates the law of conservation of energy. October 24, 2013 Click here for the warm up. October 23, 2013 Click here for the warm up. October 22, 2013 Warm Up. Click here. Science October 16, 2013 Log in to your gmail accounts. Continue working on your science study guide. Your benckmark is on Friday. Math Warm up 10/16/13 Click here for link to warm up. After you finish, close out of the program, shut your Netbook down and leave it on your desk. Study Skills: Go to your gmail account. Send the link for your form to me. Go to pjudd.weebly.com. Click here for a link to a presentation. Find the slide with your name, add a text box, and tell me 4 important things about yourself. Math Click here for the warm up link. Science October 14, 2013. Click here to get the link for the science review document. Follow directions on how to download to the desktop. October 14, 2013 Warm Up. Click here for the link. Go to this link for your warm up. When you are finished, go to Quia.com for a Math quiz. Science 10/10/13 Go to this website to learn about the types of graphs used in Science. After you have read the information, go to this link to complete a Google Form on the types of graphs. Science quiz Go to this link to take your science quiz. I want to find out how you feel about Math and Science. To help me do that, you will take an on-line survey for Math and an on-line survey for Science. You will use adjectives to share your feelings. Once you are finished, you will click the submit button. I will then take all of your comments and copy and paste them into a Wordle.